‘DuaFire’ – How About ‘No Fire’? I’m shopping for an adapter for our upcoming overseas trip but something about this one makes me nervous…. This typically goes on and on and there is never a resolution just like most discussions on social media. Multiple government agencies have come out with rulings that e-bikes should not be allowed on trails that exclude motorized vehicles. The whole motor vs non-motor seems obvious to me but some agencies haven’t ruled on the issue and some do allow e-bikes on trails. Some specifically allow them for people with a disability. I assume that the rules on e-bikes will be clarified over the next 2-3 years as the industry ramps up their offerings. E-bikes won’t sell unless people have a place to ride them so there is a fair bit of money lining up to change the laws to allow e-bikes on more trails. I’ve been involved in MTB advocacy in some form or another since 1993 and I do see e-bikes as a threat. The sky is not falling – YET – but manufacturers and some vocal e-bike users want to change the laws so that e-bikes are allowed on trails that don’t currently allow them. It’s very hard to believe that this effort won’t affect those of us who choose not to ride with motor power. In general, the proponents argue that because e-bikes don’t have a throttle and are battery powered that they should be treated as a different class from internal combustion motorcycles. Industry types and some agencies may buy this distinction but I think it will be lost on the general public who, sensibly, will see a bike with a motor and ask, “Why can’t I ride my motorcycle on those trails?”. Administrator: “Well, actually those are e-bikes – they are pedal-assisted bicycles, not motorized bikes”. Like I say this is my imagination working – the conversation won’t go exactly like this but will likely be similar. Next step is that the people who ride dirt bikes get their lobbyists and industry groups involved and Honda, Kawasaki, Yamaha, Husqvarna, etc. see an opportunity to sell MX bikes and ATV’s in greater numbers. The government gets pressured and are left with a simple choice – allow e-bikes and other motorized vehicles or do a blanket ban on all motorized vehicles. A few people decide to use e-bikes on multi-use trails even where they are not allowed. Hikers and equestrians complain to the administrators. Since the administrators can’t easily tell the difference between (for example) a Specialized Turbo Levo Fattie and a non-motorized MTB, they are left with no choice but banning all MTB’s from those trails. That’s one way you may lose access. Do you have other scenarios? Let me know. Interesting to see this sign at a trailhead in Moab the other day. 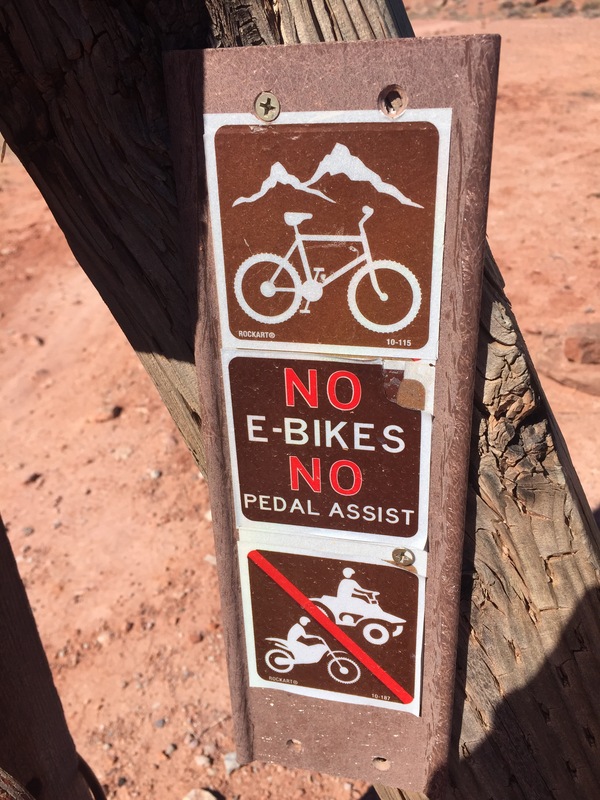 The BLM had to post both ‘No e-bikes’ and ‘No pedal assist’ since the bike industry has pushed ‘pedal assist’ as the preferred deceptive marketing term. I hadn’t made the connection until I saw this, but ‘pedal assist’ doesn’t sound like you have a motor – it just sounds like magic that helps you pedal. With the lack of technical fluency of most of the population, I can’t blame the rider for not understanding that their pedal assist bike has a motor. Glad to see the BLM is holding the line on keeping motors off these trails. There are plenty of trails around Moab where motors are allowed – so I hope the BLM and other agencies continue to hold the line on this. Interesting first visit to The Startup Building co-working space in Provo today to attend a Million Cups event. I met the building owner, Tom, and his family who seem to have made the space quite successful in the 4 years that they have owned it. Surprisingly, ‘Startup’ is the name of the family that started a chocolate company in the building 100+ years ago, and are still producing today. I got a quick tour after the Million Cups event and was impressed by the number of entrepreneurs and students who have made this building in Provo their home. One of the great things is the location. Right across the street from the Frontrunner train stop. Sure made getting to and from the event easy! I’ve ridden a number of dropper posts since about 2008. From the early days, I’ve sampled the Gravity Dropper, Crank Brothers Joplin, Fox DOSS and ended up buying the Kind Shock LEV in early 2014. For those of you who still haven’t bought a dropper post I’ll say that it’s one of the best upgrades you can make on your bike no matter what kind of bike you are riding – even a hardtail. If you like going fast downhill (or even if you don’t) it will give you more control and confidence. You’ll lower your center of gravity which gives more control in cornering and particularly on steep downhills the dropper will make you feel that you won’t go over the bars. If you’re riding flat to rolling non-technical terrain keep that fixed seatpost but if you are riding anything else and want to have more fun, get a dropper post! One of my primary considerations whenever I buy bike parts is to get something reliable. Weight and other performance issues are important but always secondary to reliability. If I have to spend too much time fixing something it takes away from my ride time. If you have ever walked a few miles to get back to the trailhead due to a broken part, I guarantee that you won’t be thinking, ‘I’m so glad I saved 50 grams on that part – it failed but it sure is light!’. My experience with Crank Brothers several years ago was with a failed seatpost that wouldn’t return to the top. That pretty much ruined the rest of my ride trying to pedal uphill with a seat 5 inches below the correct climbing height. I knew a few MTB tour guides who were leading multi-day rides and carried a backup seatpost in their packs since they couldn’t fully trust the dropper posts they were running. That wasn’t for me. So, in 2014 when I was shopping, the consensus was that the Rock Shox Reverb and the KS LEV were the most reliable posts. I tried them both in a shop and settled on the KS. It seemed particularly solid and the shop owner said he had fewer returns for repairs than with the RS post. The Fox DOSS was also out at that time but didn’t have as much of a track record so I wrote that one off. My bike (Yeti ASR 5C) didn’t allow for internal cable routing but the setup wasn’t really an issue. The external cable routing was clean and has never been a problem. Some early generation dropper posts had cables attached to the moving portion of the post (usually right at the seat mounting) which meant that the cable moved on the bike as you went up and down with the post. This was particularly annoying on the Crank Brothers Joplin as the cable housing would sometimes hit my leg or hang up on the frame somewhere. The LEV had a clean attachment to the top of the fixed portion of the post. The only weak point the shop warned me was the cover over the cable attachment that often fell off during use. The solution was to put a tie-wrap around the cover. Easy solution – but sort of disappointing to get a brand-new post and have to throw a band-aid on it right from the start. But hey – it works. The post has an air cartridge to move the post. The Schrader valve is on the top of the post and requires you to remove the saddle to adjust the pressure. Sort of a hassle, but I’ve only set the pressure once and haven’t lost any air so I haven’t had to add air all this time. The seatpost head uses the preferred 2-bolt attachment so adjusting the seat angle is easy and very secure. I’m not a big fan of button head screws as are used on the LEV since the hex size is usually a size smaller than a socket head cap screw. With the socket head cap screw you are less likely to strip out the hex if you are a ham-fisted mechanic. I understand the use of a button head since it is less likely to injure the rider in a crash than a socket head cap screw. So I’m just careful to fully engage the hex key and watch my torque. Out of the box there was a bit of side-to-side play (rotation) of the post but it was quite small and not noticeable when riding the bike. It’s more pronounced now than when I got the post but it is still just barely noticeable when riding and doesn’t bother me. I know some people who care a lot about these details so if you are one of those people you might not like it. One of the key issues with any post is the remote lever design. The ergonomics and feel of the lever are critical. You want the lever to be located in a good position so that access is good – the most critical time to drop the post is just before a technical section and that is the last time you want your hand off the bar trying to activate a lever. The lever shouldn’t require too much force or throw (travel). It should also have enough ‘feel’ so you can detect the release point and know when the post will move. The KS lever meets all the critical criteria. I initially thought it might be a bit small but I’ve come to like it. If you’re running ODI lock-on grips the lever even integrates with the grip. Take off the inside collar and the clamp of the KS lever just slides onto the grip. Nice detail. Some dropper posts have an adjustment for the speed that the post goes to the up position. The return speed on the LEV is governed only by the initial air pressure setting and the speed has always seemed fine to me. Just fast enough and very consistent. This post has been pretty much bullet proof. I rode it for 2 1/2 years before the first issue popped up. There was a noticeable clunking and a bit of stickiness when moving up to the top position. I assumed that I would have to send it back for service but I opted for the very simple sealhead service as described here http://blog.artscyclery.com/mountain/ask-a-mechanic-service-and-maintain-your-kind-shock-lev-dropper-post/ This was surprisingly easy and put the post back to like-new condition after just 30 minutes of effort. The LEV is a good post. Reliable and consistent performance and it hasn’t let me down. I’m starting to shop for a new bike and I definitely want a KS post on my next bike.